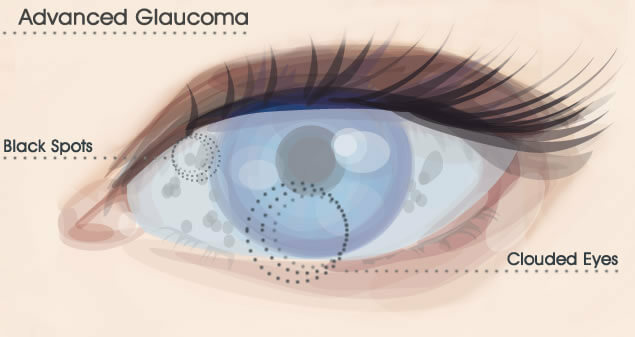 Glaucoma is a group of eye diseases that affect the optic nerve, the nerve which communicates vision from the eye to the brain, and causes vision loss. The pressure inside the eye is called intraocular pressure, or IOP. An increase in intraocular pressure is the most common sign of glaucoma. A normal IOP can range from 10-21 mm Hg and is the most important risk factor to consider while maintaining eye health in order to catch early stages of glaucoma. A small space at the front of the eye is called the anterior chamber. Clear fluid known as the aqueous humor flows in and out of the anterior chamber to nourish the tissues. When glaucoma occurs, the fluid drains more slowly, and as the fluid builds up, the intraocular pressure rises in the eye. This uncontrolled pressure results in damage to the optic nerve. Half of the people with glaucoma are usually not aware they have developed this condition until they experience a severe vision loss. Most people with glaucoma do not notice symptoms until they begin to have significant vision loss. Small blind spots develop, usually in the peripheral or side vision. Blindness from glaucoma is a result of the optic nerve being totally destroyed. Sudden increases in IOP, especially with acute angle-closure glaucoma, may include blurred vision, halos around lights, severe eye pain, headache, abdominal pain, nausea, and vomiting. In angle-closure glaucoma, the normal drainage canals within the eye are blocked. Angle–closure glaucoma can be acute (sudden) or chronic (long-lasting). In acute-angle closure glaucoma, a sudden increase in IOP occurs because of the buildup of fluid known as the aqueous humor. Acute angle-closure glaucoma is considered an emergency because optic nerve damage and vision loss can occur within hours of the onset of the problem. Chronic angle-closure glaucoma may cause vision damage without symptoms. In open-angle glaucoma, the drainage system remains open. Open-angle glaucoma also may cause vision damage without symptoms. Normal (or low) tension glaucoma is an unusual and not well understood form. The optic nerve is damaged even though the IOP is consistently within normal range. Congenital glaucoma is a type of childhood glaucoma that usually develops soon after birth. Signs include tearing, light sensitivity, and cloudiness of the cornea. Secondary glaucoma refers to an increased IOP that is a result of a structural problem within the eye. This secondary type may be the result of injury to the eye or other medical conditions. In addition, many other eye disease and systemic conditions can lead to glaucoma by increasing the IOP. Applanation tonometry: A sensor is placed gently on the surface of an anesthetized eye, and a very accurate IOP is measured. This should be monitored 3-4 times a year in glaucoma patients. Dilation: An examination to inspect the back of the eye through dilated (widened) pupils is required to diagnose glaucoma. A characteristic divot or depression in the optic nerve at the back of the eye caused by damage from elevated eye pressure is noted. This enlargement is called “cupping” of the optic nerve. Visual Fields: Another test, perimetry, is used to determine the presence of defects within the visual field. Because people with glaucoma tend to lose their vision from the outer edges to the center, checking peripheral vision is very important. Air puff: This exam is commonly used by most optometrist, however, it is not very accurate. OCT: Computer images of the optic nerve are taken regularly. Most tests have to be done on a regular basis, once or more a year. Pachymetry: This test is used to check the thickness of the cornea to avoid false positive or false negative IOP measurements. Gonioscopy: This test uses a lens to look at the internal structure of the eye. Treatment is designed to lower the IOP by reducing production or increase outflow of the aqueous humor. Depending on the type of glaucoma, medications or surgery are used. There are various kinds of medications used to control the IOP, such as pressure eye drops. Betagan, Betimol, Betoptic-S, Istalol, Timoptic and Timoptic XE, Lumigan, Xalatan, Alphagan, Azopt, Trusopt, Travatan, Combigan, and Cosopt are the most commonly used medications for maintaining good intraocular pressures. In more severe cases, Diamox is administered by mouth. In some cases, surgery may need to be performed because the right combination of medications is not effective. Emergency laser surgery (iridotomy) may be necessary. When performing an iridotomy, an opening for increased drainage is created in the iris to relieve the buildup of increased pressure inside the eye. An iridotomy is also done to prevent an attack of angle-closure glaucoma in high risk eyes. Medication in most cases does not work for congenital glaucoma; therefore, surgical intervention is required. Trabeculoplasty, ECP (Endoscopic Cyclo Photocoagulation), Block cell and Valve Filtering are just a few types of surgeries performed to help glaucoma. The main objective for these surgeries is to try to ease the drainage of aqueous humor in the affected eye or eyes in the hopes of reducing the IOP. Medications Know when and how they should be taken. Signs and symptoms Know what symptoms to anticipate that may suggest medication failure, side effects, or other problems. Limitations Know what activities you must refrain from and for how long. Follow-up exam Know when to set up an appointment with your doctor for your follow-up exam and if tests need to be performed. In most cases, the best prevention for glaucoma is early detection. If detected early, vision loss and blindness may be prevented. Anyone older than 20 years of age should have a glaucoma screening. Periodic eye exams are recommended for the rest of your life to help prevent and identify glaucoma, especially if you have certain risk factors, e.g. having a family history of glaucoma. Although glaucoma cannot be cured, it can be controlled. People with glaucoma need to have regular eye examinations and usually need to continue treatment for the rest of their lives. Untreated acute glaucoma results in permanent vision loss. Untreated chronic glaucoma can progress to blindness. Early diagnosis and treatment usually results in excellent success and the vision is saved. Is Glaucoma treatment right for me? At Miami Eye Center, Dr. Joseph Selem will meet with you during your private consultation to assess your individual situation. 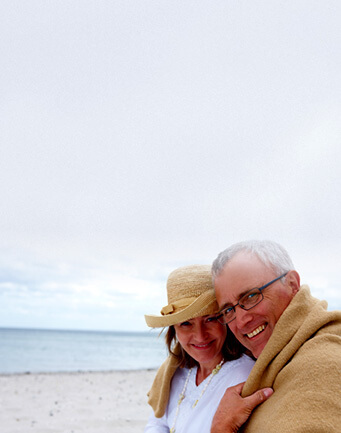 Dr. Selem can help you decide which Glaucoma treatment in Miami is right for you. See the beauty in yourself and the world around you in crisp, clear detail today! Request an appointment online or call Dr. Joseph Selem and the staff at Miami Eye Center at 305-444-0221 to schedule your private consultation.